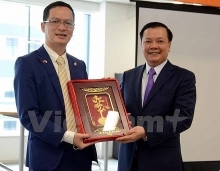 In July 2016, Hitachi integrated its escalator businesses of Japan and China, consolidating its resources and enhancing its business operations in both countries, centered around its key business location in Guangzhou, China. The new TX Series escalator launched by Hitachi is a model that meets multiple standards in China, India, Asia and the Middle East. The model follows the same concept for the machine room-less elevator for Asia and the Middle East which was launched in September 2016. In addition to conforming to Chinese safety and quality standards for escalator equipment, the TX Series will be manufactured in accordance with Hitachi’s own strict standards of safety and quality, adhering to safety standards in all other regions. It also adopts a functional design based on the concept of an escalator that fits closely with the unconscious actions of users, in the pursuit of their ease and comfort. The TX Series offers flexibility with a selection of various product specifications, as well as its excellent design and safety features, designed to cater to a diverse range of customer needs. It also saves space required for the installation, covering a smaller area in comparison with existing products. Hitachi will begin sales of the TX Series in ASEAN and various other regions, and aims to receive orders of 10,000 units in 2018 in China, India, Asia and the Middle East. The TX Series offers various new safety features designed with optimal user safety in mind. 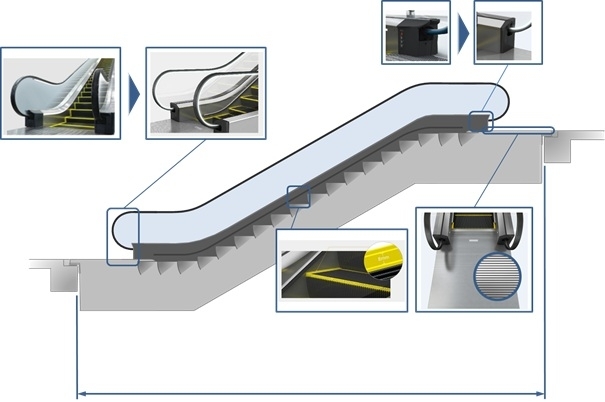 The side portions of the steps are 8 mm higher than the central portion to prevent accidents in which a users’ shoe can become caught between the step and the skirt (side wall) of the escalator. The new TX series has also been fitted with brushes located at foot level on the left and right skirts to let users know if their foot comes into contact with the side walls. A special finish has also been adopted for the landing plates at the entry and exit points of the escalator to prevent users from slipping when getting on and off the escalator. The TX Series adopts a simple and functional design that offers the smoothness, safety and comfort that users unconsciously expect to experience when riding an escalator. For example, by minimizing the size of the metal frame supporting the escalator’s balustrades, the TX Series’ design maximizes the size of the glass surfaces, and achieves greater simplicity at the entrance and exit points (landings) by reducing the number of recesses and protrusions around the hand rail. Additionally, by expanding the installation space of the light fixture, the TX Series also enables enhanced lighting options for illuminating the entire surroundings of the balustrades. By shortening the span dimensions*3 by 150 mm, the TX Series has made it possible to install escalators in more confined spaces where installation presents difficulties with conventional product designs.